The Druid Peak pack was one of the most famous wolf packs in Yellowstone history. The pack’s high visibility in Lamar Valley allowed thousands of visitors to observe them every year. The Druid Peak pack originally consisted of five individuals that were released together during the second year of re-introduction efforts in 1996. They quickly displaced the Crystal Creek pack and established territory in Lamar Valley. In 1997 a wolf from the Rose Creek pack (21M) replaced the original alpha male after he was illegally shot outside the park. In 2000, three different females denned including the alpha female (40F), her sister (42F), and another subordinate female. Alpha female 40F died shortly after and was likely killed by wolves from her own pack. Her sister (42F) took over the new alpha role and that year the pack successfully reared 20 pups. The following year the successful pack consisted of 37 individuals, one of the largest packs ever recorded. With such a large pack and increasing territory, wolves from the Druid Peak pack splintered off to form the Geode Creek, Agate Creek, Buffalo Fork, and Blacktail Deer Plateau packs over a 6 year period. The alpha female (42F) was killed by wolves from the Mollie’s pack in 2007 and the alpha male (21M) was found dead of natural causes during the same year. Wolf 286F (who was replaced the following year by 569F) and an uncollared black male (later collared as 480M) became the new alpha pair. Wolf 302M, nicknamed “Cassanova”, had bred with some Druid Peak pack females in 2003 and joined the pack with 480M in 2007 only to leave the pack in 2008 to form the Blacktail Deer Plateau pack. The following year proved difficult for the pack as the new alpha female (569F) was killed by other wolves which resulted in alpha male 480M leaving the pack (he was related to all remaining females in the pack). No pups survived, likely due to complications associated with severe mange infections, and by the end of the year the entire pack was affected by mange. 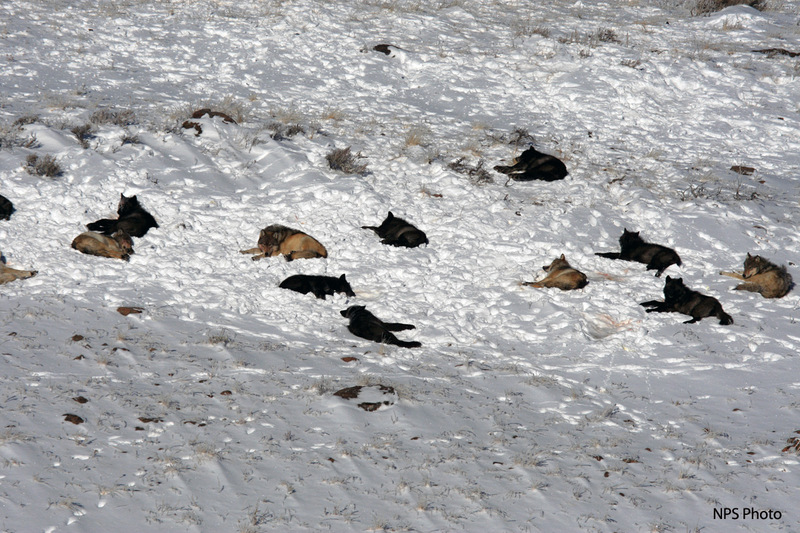 In early 2010 the pack persisted by scavenging carcasses from other packs, resulting in high mortality due aggressive interactions with other wolves. The remaining Druid Peak wolf was 690F who was legally shot near Butte, MT, ending the legacy of this famous pack.